More later; let the work week begin! On occaision, when we are chatting about quilts, Mom will ask me if I know what happened to Adam's Snake Quilt. 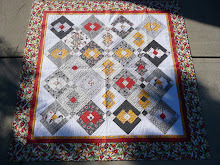 She will remind me it is one of the favorite quilts she ever made, and it is on the back of her book Miss Jump's Favorites (click the link and you can see more projects from the book on the Homespun Peddler's website). It is an amazing quilt. I have always been reluctant to ask Adam what became of the quilt, so I would remind Mom that Adam has moved numerous times in Atlanta and in Nashville, and that he even left my Stearns & Foster mattress at one of the addresses. I really had no idea what became of her quilt. Adam and Mary Elizabeth are in the process of moving back into Atlanta, so after they left with a load of household goods yesterday I started cleaning up. I was getting some fresh linens out of the hall closet when I spied some crazy fabric up on the top shelf. Adam has kept the quilt quite safe all these years. It is wonderful to know he loves it and it is safe. I can hardly wait for Mom to read my blog today. I will call her when I get off work to be sure she read all the way to the end and didn't stop at the picture of Arlo (Hank Carl).